Terry is formerly an organic farmer and sprout grower who was a part owner and manager of Eatmore Sprouts Inc. and Earthbank Farm in the Courtenay area from 1977 to 1991. As a young man, Terry was an avid organic gardener who learned all about composting at the (right) end of a pitchfork. 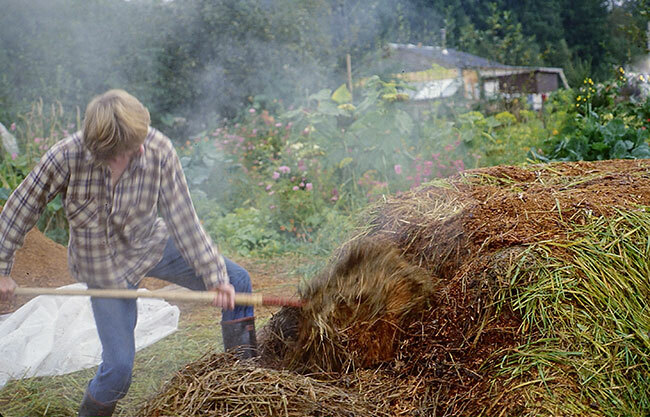 Earthbank has its roots in producing literally hundreds of yards of hand-turned composts in the early years. Terry also had the privilege of working with an organization known as the Demong Society, an organization that was dedicated to recycling our waste through composting in the early 1980’s. The Society was formed as a memorial to Roger Demong, his wife Marion, and their three young children who all died in a tragic car accident in 1980. Roger was a tireless advocate in his role as the Comox Valley District agriculturist in promoting the recycling of our organic waste stream back onto farmland. The Demong Society was the first organization to compost sewage and a number of other organic waste materials in the Comox Valley that at the time were either being dumped into Georgia Strait, or going into our landfills. The Demong example led directly to the Comox Valley establishing the first successful sewage treatment and compost plant in B.C. 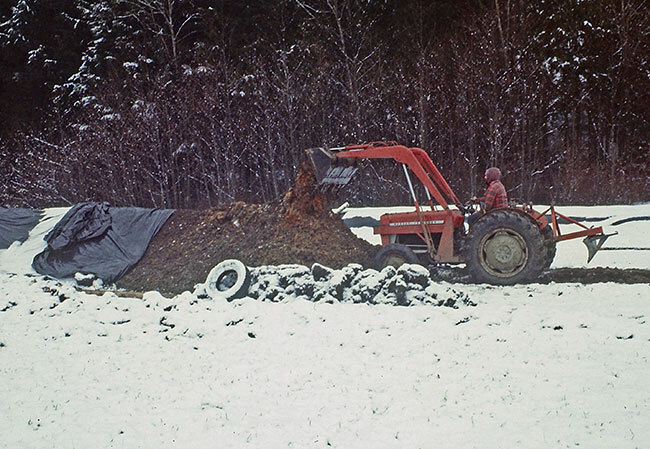 Further, it was the Demong example and opportunity that paved the way for Terry to establish a septage composting facility on Dove Creek Farm near Earthbank Farm that eventually became Earthbank Resource Systems and further evolved into an exclusively fish composting operation. In the late 1980’s and early 1990’s, coinciding with the rise in salmon farming on the West Coast, the provincial government banned the disposal of fish waste into our landfills. As Earthbank already had a track record in septage, manure and other waste composting, we were approached to start handling both farmed and wild salmon waste for composting. We were able to develop a methodology for composting salmon waste that is now very successful and has undergone many changes over the years. As a result of the availability of this waste stream for composting, there are now only two large scale operations (including Earthbank) that have emerged that produce most of the compost utilized on Vancouver Island. The vast majority of fish compost available on Vancouver Island is produced from waste generated by the salmon farming industry. Fish compost, whether known as fish compost or by some other trade name is the compost of choice on Vancouver Island. Even though there has been some compromise of quality by some producers, in general terms it is a spectacularly successful product that is unrivalled by other composts. Though Earthbank has been producing large volumes of fish compost since 1991, it has never been necessary to aggressively market our product. We have routinely been in short supply of cured compost almost from the outset even though we dramatically increased our volumes over the years. Presently, that situation is somewhat alleviated due to the handling of much larger volumes of fish waste in recent years. However, we continue to see demand increase and anticipate that oversupply is not likely at Earthbank for the foreseeable future. We believe that this market will grow for years to come. On the matter of contamination issues regarding farmed salmon waste, please see our Compost Quality page for information on this controversial and poorly understood subject.